Tomorrow is the first day of April. Hooray! 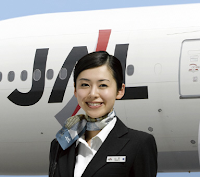 JAL posted the results of its first flight-attendant exam on this day in 1931. Of the 140 women who took the test, hoping to become an "air girl," only three passed. This country's first escalator was installed in Ueno on this day in 1914. It moved at a speed of 1.08km/h (the current max is 2.196km/h). Takashimaya became Japan's first retailer to use a mannequin to display its products at a clothing expo in 1928. The word "mannequin" was seen as auspicious, because it combined mane (to beckon) and kin (money). Marimo, a species of filamentous green algae, was included in the list of Japan's Natural Monuments on this day in 1952. These fuzzy green balls are known to form only in Japan, Estonia, Iceland and Scotland.